Overflowing flower pots, margaritas on the porch. Rose, citrus, geranium and palmarosa. Terra is our all-natural must-have. Once the candle's gone, the vessel is designed for rest as a planter, making the perfect 2-for-1 item for your home. 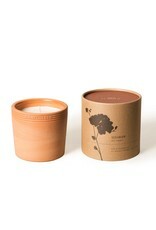 Ingredients: 100% natural soy wax, plant-derive fragrance, cotton wick.